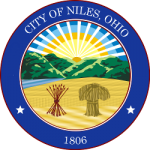 The Niles Library Association was established in 1908 with support from private subscription and both city and school board appropriations. The Niles Public Library started in a modest room on State Street. The Library was later moved to the post office building where it remained until 1916. For one year the Library occupied a building on the current McKinley Memorial grounds. The National McKinley Birthplace Memorial was built to honor our fallen president, born in Niles, Ohio. Joseph Butler, McKinley’s childhood friend, was instrumental in the planning and fundraising in order to have the Memorial built. He envisioned the public library occupying the south wing of the Memorial. In 1917, with the completion of the Memorial building, the Library moved into the south wing. In 1918 the name was changed from the Niles Library Association to the McKinley Memorial Library Association. The Library has always remained a Public Library. In 2017, the Memorial celebrated its centennial. The McKinley Memorial Library is a member of CLEVNET, a consortium of libraries providing patrons with shared access to more than ten million items, exclusive online subscription resources, and a rich collection of downloadable media.